Have a hard time getting past the character selection screen of video games because you’re too busy picking out the perfect clothes and styling your hair just right? If so, there’s some fashion-oriented VR applications popping up that might be right down your alley, namely Voxcell Design’s NailCanvasVR, a tech demo that uses the Leap Motion hand-tracking controller, letting you virtually change the color and design of your nails without all of that nasty acetone (that you keep smelling up the bathroom with). Voxcell Design has been producing nail fashion software from their Japan based studio since 2009, when they first released a Windows version of NailCanvas, an application that was eventually rebuilt in 2012 for the iPhone. 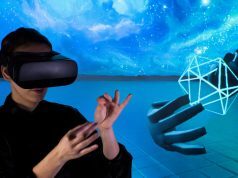 The studio has since taken a new direction with the introduction of NailCanvasVR, which integrates the Leap Motion hand-tracking controller and Oculus Rift DK2 to provide an experience that aims to bedazzle. 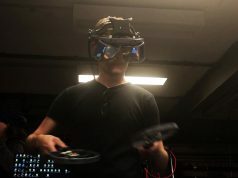 The Leap Motion Controller, the primary input device for NailCanvasVR, uses stereo infrared cameras and attaches to the DK2 and determines the position and movement of the hands, allowing you to pick a wide range of nail colors, shapes, or effects that are applied instantly to a virtual representation of the user’s hands. 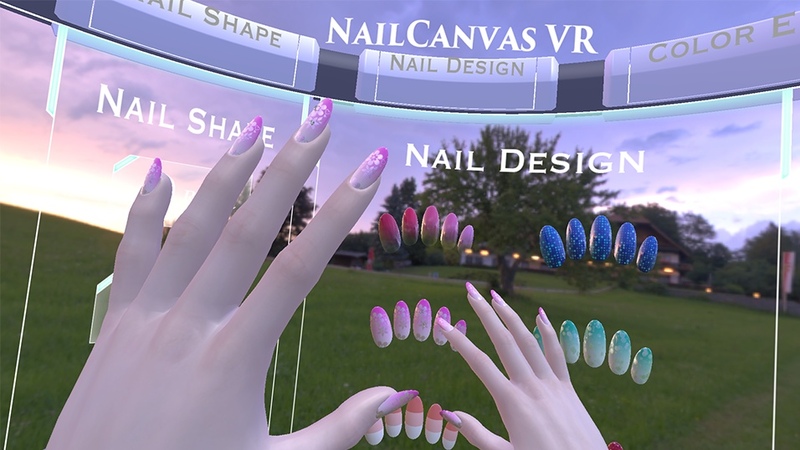 Choosing the perfect color and rhinestone nail art can take time though, so lead developer Kei Wakizuka has also added ambient environments to fill out NailCanvasVR’s visual palette, making it decidedly a much more meditative experience. Wakizuka, the mind behind the NailCanvasVR, is a visual database engineer by trade and doesn’t at all consider himself a programmer or game designer—a possible explanation for the unique way he’s approaching the space. Of course, gaming and architectural simulations are good for real-time 3D, however I would like use this field not just for gamers or computer enthusiasts, but a much wider audience. In addition to this, I was looking for an area of application that has a value of realism and beauty, and that also allows the user to personalize and edit in-game content. I would eventually like to distribute this system to nail salon companies, or a wedding planning companies for example, and hope that with the help of the Oculus Rift that the field of VR and 3D computer graphic systems can even spread to ordinary people. Wakizuka intends to use NailCanvasVR to handle selection and viewing experiences, while a creation tool called NailCanvas Pro for PC will serve as the back-end for the nail art design data. 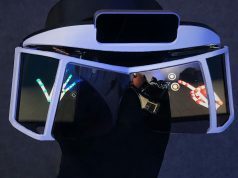 We wonder if any of his recent experiments will make it to the final version though, like his incorporation of Ovrvision, an aftermarket device out of Japan that functions as a stereoscopic pass-through camera for VR headsets, adding the possibility for some pretty interesting AR interactions. If you’re adventurous and don’t mind wading through the garbled mess of Japanese to English translation courtesy of Google Translate, then go no further, because nearly all of Voxcell Design’s content is currently only available in Japanese—a shame considering the near universal appeal of fashion. Both Windows and Mac versions of the tech demo can be found clicking the link below.